Understanding the interplay of the various degrees of freedom such as the electrons, spins and lattice is essential for many complex materials, including the high-temperature superconductors. In the case of the Fe pnictides, especially the strong sensitivity of the electronic and magnetic properties to the exact shape and size of the Fe-As tetrahedra (Fig. 1, left) plays a crucial role for superconductivity and demonstrates a strong magneto-structural coupling. In addition, antiferromagnetic phases are closely linked to structural distortions in these materials. Here, we use femtosecond time-resolved x-ray diffraction at FEMTO to investigate the structural dynamics in the Fe-pnictide parent compound BaFe2As2. We observe fluence dependent intensity oscillations of two specific Bragg reflections with a period of ~200 fs (Fig. 1, right). Their distinctly different sensitivity to the pnictogen height h demonstrates the coherent excitation of the A1𝑔 phonon mode and allows us to quantify the coherent modifications of the Fe-As tetrahedra. By a comparison with time-resolved photoemission data we derive the electron-phonon deformation potential for this particular mode, which is comparable to theoretical predictions. 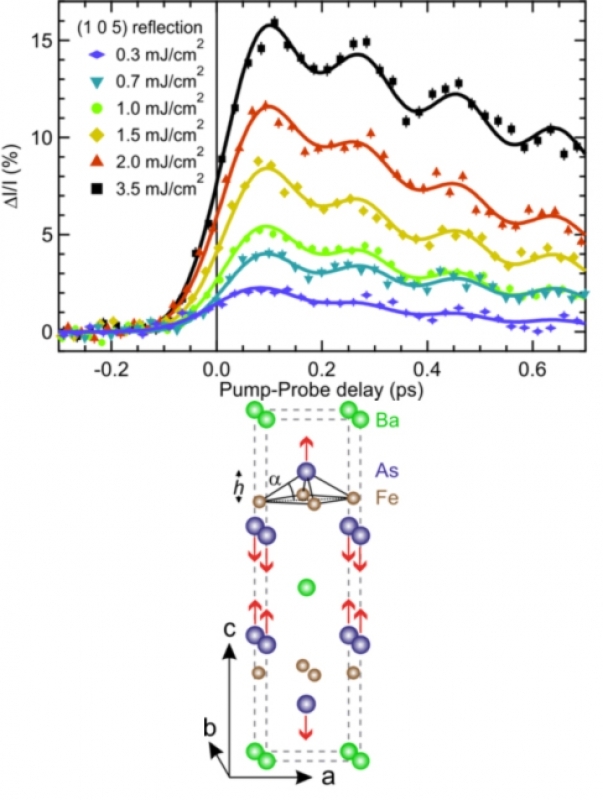 Our results demonstrate the importance of this structural degree of freedom for the electron-phonon coupling in the Fe pnictides and indicate a transient increase of the Fe magnetic moments on an ultrafast timescale. In addition, in the spin-density wave ground state we investigate the reduction of the orthorhombic distortion by the laser excitation. The orthorhombic splitting of the Bragg reduces on a timescale of several tens of picoseconds, compatible with domain motion. This contrasts with the ultrafast quench of the magnetic ordering in <200 fs and provides further information about the coupling of magnetic and structural degrees of freedom. Figure 1. Top: Pump-induced change of diffraction intensity of the (1 0 5) reflection. Bottom: Structure of BaFe2As2 with the motion pattern of the A1g phonon mode (red arrows).